AngularJS is an MVC based framework. Google developed AngularJS. AngularJS is an open source project, which can be used freely, modified and shared by others. This means that any changes to the model update the view and any changes to the view updates the model. AngularJS has a built-in Dependency Injection, which makes application easier to develop, maintain and debug in addition to the test. Angular will test any of its code through both unit testing and end-to-end testing. Split your application into MVC components. Maintaining these components and connecting them together means setting up Angular. In this project, the description is about the steps to create treeview structure of File and SubFile using AngularJS in MVC and This procedure can be implemented in case of Modules and related pages under each module in ERP type of project. So, here I show you a project which you can implement in a real-time scenario for better understanding of how many pages there are under respective Modules and the relation between Module and its corresponding pages. Create a table named "Treeviewtbl". Then I have created an MVC application named "FileStructureAngular". Here I have added Entity Data Model named "SatyaModel.edmx" . Inside HomeController I've added the following code. Fetch data from the database and return it as a JSON result. I used a recursion method required for angularTreeview directive. Add a partial class of "Treeviewtbl" class for adding an additional field for holding child items. Here is a field property "children" for identifying child nodes. So we need to add an additional field in our Model. So, I will add a partial class to add an additional field to hold child items. Add required files into our project. In this article, I am going to use angularTreeview directive. This a very popular directive to render treeview from hierarchical data in AngularJS application. The angular.treeview.css file is present in the Contents Folder. The angular.treeview.js file is present in Scripts Folder. I have added 3 png files for folder closed, folder opened, and files inside folders. Here folders are the Modules and files are the pages under respective modules. Add a dependency to your application module. Here I created a module named myApp and registered a controller named myController and then added GetFileStructure controller action method of HomeController for fetching data from the database and it returned as a JSON result. Add view for that (here index action) named "Index.cshtml". Here I have created a module name and registered a controller name under this module. Copy the script and css into your project and add a script and link tag to your page. Attributes of angular treeview are below. tree-id : each tree's unique id. tree-model : the tree model on $scope. node-id : each node's id. node-label : each node's label. Then I mentioned a span tag for showing the text of selected folder and file name inside treeview. I have used angularTreeview directive for generating treeview from hierarchical data. For initial page load, here all folders or modules are open and all related files or pages of corresponding modules are as shown below in blue icon. Folder or Module in the yellow icon. Files or Pages in the blue icon. Folder or Module In Closed Option. As per selection of module or pages, the text is shown in red. 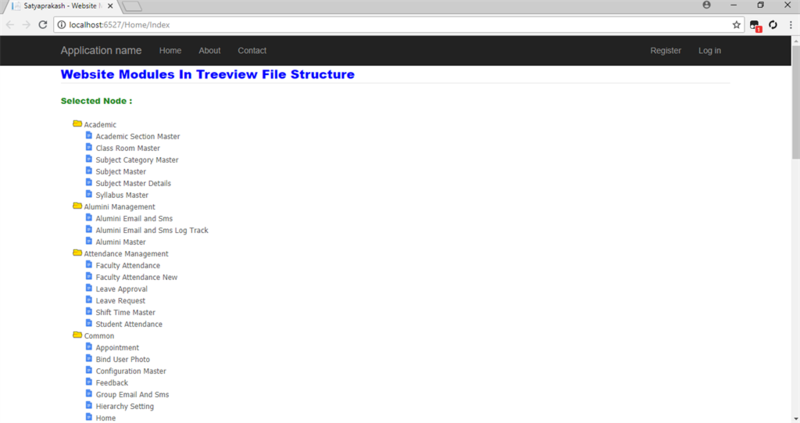 Treeview using AngularJS in MVC. AngularTreeview directive for generating treeview from hierarchical data. Sample project about Modules and Pages in treeview. Implement Recursion method for recursively getting all children.